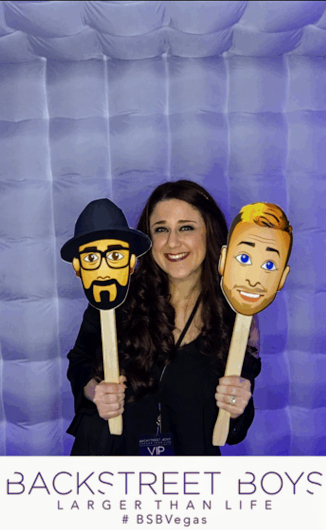 What has kept Kristin Heckel of Wisconsin a Backstreet Boys fan all of these years? Heckel, who was born in Saudia Arabia and spent most of her life in Arizona, was reigned in by the Backstreet Boys by something so simple that it’s almost funny. What was something more than music that put a smile on Heckel’s face? When she found out this past spring that she actually won a VIP meet and greet with the Backstreet Boys for her March Vegas show. While Heckel’s sister, who attended the Vegas show with her, was skeptical, Heckel was able to confirm through others that the email was not spam or a scam and she had actually won. “I was an amazing experience, one that I never expected to actually happen in my life, to be honest. I can never fully express who thankful I am to have won,” Heckel said. Where are you from? I was born abroad in Saudi Arabia, though I lived the majority of my life in Arizona. Needing to escape from the heat, my husband, son, and I moved to Wisconsin just about 2 1/2 years ago. What do you do for a living? I hold the title of "Residential Loan Regulatory Specialist" which sounds way more badass than anything I actually do, ha ha. I'm back of shop of residential lending for a bank, creating and sending initial mortgage documents out to borrowers. My primary function is putting together preliminary closing disclosures. I hunt down a lot of various documents to find, pull out, calculate, and plug in what feels like a million bits information to prepare my disclosure. I send my completed docs out to the borrower and in the next 3-7 days they close on their new home. It doesn't sound overly interesting but I thoroughly enjoy it. It keeps my brain engaged, I need that. How long have you been a BSB fan? Late 1998 soooo coming up on 19 years. How did you become a fan? My older sister was home on break from college. She had one of those giant cases that held like 300 CDs. She would take out the covers of the CD cases and cut them to fit the opening and then slip the CD behind. She's a little OCD, I know. I was flipping through and I came across two sets of five, like oh my god so totally hot, faces. Grabbed one, popped it in the 5-disc capacity stereo - oh yeah that's right, what up! - and the glorious sounds of "Quit Playing Games With My Heart" started to flow out of the speakers. She had two CDs of theirs, both only being singles, and "As Long As You Love Me" was the other. I only got a hint of them and I needed more! The rest is history. What is your favorite BSB memory? Meeting them! Brian & Kevin give the best hugs! *swoon* I now connect them with the smell of leather since 3/5 guys were wearing leather jackets and the whole area smelled like dead animal hide. In the best way possible of course. What is your favorite BSB song and why? Oh man, I don't know if I can give an answer to this one. I think it's easier and definitely quicker to answer which BSB songs aren't my favorite, ha ha. Hmmmm...If I'm going to only pick one, it's going to have to be "Rush Over Me". It was included on the playlist for my wedding. When my husband and I met, I was fresh out of a tumultuous relationship. I was pretty resentful towards love with no interest in it in at all. I certainly wasn't looking for a romantic connection of any sort, let alone a husband, but apparently, the universe had a different plan. The lyrics of "Rush Over Me" synced perfectly with my feelings towards my then-boyfriend turned fiance turned husband. He made all my pain, sorrow, and apprehension fade away with all the love he gave me. Each time I hear that song I fall in love with my husband all over again. What is your favorite BSB video and why? “I Still” is my absolute favorite video of theirs. They each did a wonderful job depicting the painful sadness that goes along with heartbreak. That video draws out so much emotion from me. At that moment they all start to crumble from heartache. Holy cow. Kevin throws the glass at the mirror. Are you kidding me?! Amazing. Who is your favorite Backstreet Boy and why? From the moment I first saw the boys, I was hooked on Brian. Those eyes! That accent! He has the one of two the most perfect noses in existence, the only other perfect nose belonging to my husband. I always loved his goofy personality, his joking around, and his desire to make everyone around him laugh. Brian will always hold a special place in my heart but now he has to share the spotlight of my adoration - enter one Mr. AJ McLean. As I've transitioned into adulthood I have gained my own belief systems, opinions, and values. Taking in all of AJ's various social media posts gives insight to the man that he has become. AJ and I seem to have similar perspectives. As an adult, I appreciate and more so connect with the like-mindedness of subjects that I believe have much importance in this world. I feel as if he's most likely the BSB that I would be able to have many lengthy, meaningful, complex conversations with. Little me LOVES Brian big me LOVES AJ. About a year ago or so I forgot to lock my car. The next morning I realized what I had done. I went outside and sure enough someone went through my car. They only took two things: an auxiliary cable and my entire collection of BSB CDs. My first BSB CD, gone. The import Backstreet's Back that my sister had a friend ship to her that she gave me on my 14th bday and I broke down into tears, gone. The Black & Blue CD that I convinced my parents to take me to the store for the midnight release, gone. All those Burger King CDs, history. I know, I know, some people are probably scolding me for keeping them in my car but I listened to them constantly. They were well used and well loved! Anyways, of course, I was upset and disappointed. Who wouldn't be? Rather than allowing the anger to consume me, I went another route. I viewed it as an opportunity for someone new to be introduced to their music. If they're rummaging through other people's cars they're probably not living a life that currently involves music like BSB. I hope they listened to some of the music, I hope they felt the same pings of happiness that I do, I hope that their actions unconventionally brought BSB into their lives and they're now a better person for it. BSB improved my life, maybe, just maybe, because I left my car unlocked BSB has now improved their life. What is your favorite thing about being a BSB fan? Being part of a community of people that are still around for the same reasons I am. Back in the day everyone jumped on the boy band bandwagon. They were hip, they were cool, they were trendy, #1 on TRL! Years have passed, trends have changed, and people have jumped the wagon. We as fans have held strong with our legitimate appreciation for the boys that are now men and their music that they keep graciously giving us. Speaking of I'm DYING for the new album already! Come on guys, PLEASE! I see that you've already been to Vegas to see the guys. What did you think about the show? The show was fantastic. If you haven't gone, you need to. It's as plain and simple as that. I still hold the Into the Millennium tour at the #1 spot but Vegas was a very close second. That's simply just speaking of the show itself. The night? The night in entirety was just absolutely incredible. As if meeting the friggin' Backstreet Boys wasn't major enough, one of the security team offered to bring me into the pit. THE PIT PEOPLE! I had heard so many horror stories about the pit so I was a bit unsure about accepting but I'm in Vegas, I just met 5 of the sexiest men alive, and now being given the opportunity to be smack dab in the middle of all the sweaty dancing action? UM, YEAH, IT'S HAPPENING. I had never been so close! I think the closest I've ever been at a concert is maybe 14 rows back. I was holding the security gate at the end of the catwalk, what the what?! I got to touch Brian and Kevin's hands! Gah! The energy, the audience interaction, the confetti! Oh the confetti...little pink strips delight raining from the ceiling. I reverted to my 13-year-old self that night and she had the time of her life.